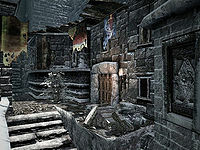 Belyn Hlaalu's House is a small home in the Gray Quarter of Windhelm. It is the first house on the left when entering the Quarter from Candlehearth Hall. It is the home of Belyn Hlaalu, the owner of Hlaalu Farm, who lives there alone. It consists of one area, Belyn Hlaalu's House. There is only one zone in the house, the interior. The front door opens up to the sight of an old cart stashed underneath a ladder leading upstairs. Along the eastern wall sits an end table with clutter, with a pickaxe on top. At the foot of the ladder is a dresser with clothes. An entrance to the west leads to the dining area; the southeastern corner has seven food sacks while the nearby set of shelves holds a gourd, a honey nut treat, three heads of garlic, a sample of scaly pholiota, a bouquet of lavender and a potion of minor healing. Leaning against the shelves is another pickaxe. 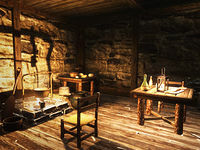 The obligatory fireplace can be found along the southern all, with a cooking pot above the hot ember, and a head of cabbage leaning against the wall. The table in the southwestern corner holds three potatoes, a wedge of goat cheese, and a wedge of Eidar cheese. The dinner table only seats one and has more food, including a slice of bread, a boiled creme treat, some grilled leeks, along with a bottle of Nord mead and a bottle of regular wine. Lastly, the shelves in the northeastern corner have two bottles of alto wine, a bottle of regular wine and a Nord mead on display. The upstairs area is spacious but also rather bare-bones. At the top of the stairs is a small table with a bottle of wine. In the bedroom, two food barrels decorate the southeastern corner, one of them located right next to Belyn's owned bed. In the adjacent corner is an end table with clutter, a copy of Dunmer of Skyrim and a respawning knapsack with leveled items. The chest contains random items while the dresser contains random clothes. More clothes are scattered around the dresser; a pair of boots, a hat and a belted tunic. Hidden behind the dresser is a copy of the Conjuration skill book 2920, Frostfall, v10. The Thieves Guild-related book Shadowmarks can be found here as loot. With the exception of some barrels, sacks, and the knapsack, all containers in the area are non-respawning and safe to store items in.